Few months back, I got opportunity from BlogAdda to visit the Bolt Arena in Crown Interior Mall in Faridabad and share my experience about the brand new BOLT car launched by Tata motors. 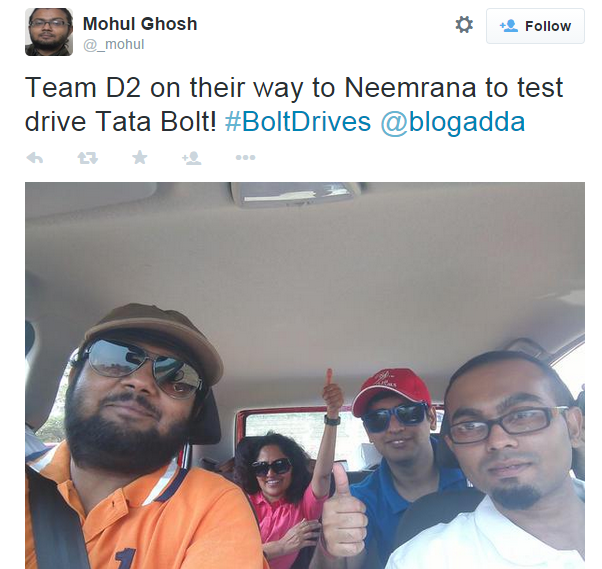 Last week I received an email from their team again and was invited to test drive the brand new TATA BOLT along with fellow bloggers. 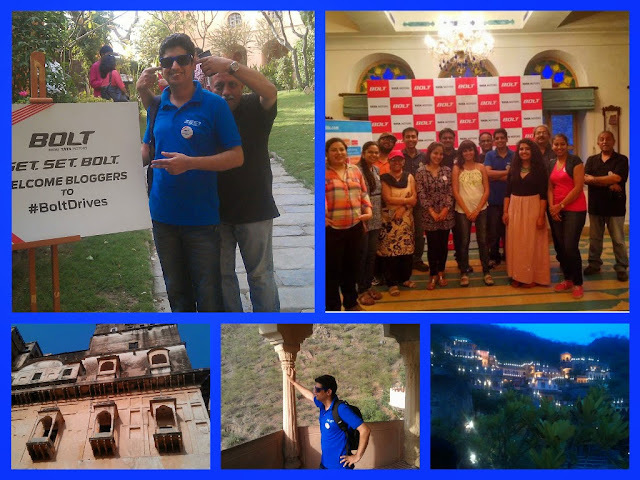 I would like to share my experience about the incredible and entertaining trip to Neemrana fort and #Boltdrive. It was Sunday afternoon and at around 11:45 am reached the Galaxy Hotel. It was great to see BlogAdda team again after Zestful experience in Goa almost a year back when TATA launched Zest car to #ZestUpYourLife.As I entered the Godfather lounge after meeting other bloggers,I received the goodie bag and I was quite happy to see a special badge and red cap with my name mentioned on it. It is such moments which make the whole experience really cool when you get personalized attention. The meet started with snacks and drinks followed by introduction by blogadda.As per their plan,bloggers were divided into group of 3-4 members plus a captain who would guide us and help us for any sissues.Then we had an ice breaking introduction session. It was fun to introduce by blogger team which included Mohul who is budding author and Mrs Seema, social activist. This was followed by presentation by Tata motors marketing team. At that point of time, we were told about Bolt special 'DriveNext','DesignNext' and'ConnectNext' and how these features revolutionize the way we drive, we connect with technology and the way we want our car to look. Then we were given a small brief before the test drive with route map. Around 2 pm in the afternoon, we had lunch before heading out to get set bolt! Once I was in the car, I felt very comfortable and I could sense that the leg space is more than enough and Bolt can easily accommodate 5 people and still have space for a small child. As we were waiting for flag off and start our trip, we got a warm welcome voice message from Captain Bolt. He was our virtual companion for the whole drive and was in constant touch with us as we shared our journey and Bolt drive experience with him at different point of time.My fellow blogger Mohul and other team members were constantly active on twitter as we shared our Tata bolt experience on twitter and other social platforms. The best part of this test drive was that it was not just a drive but a real test drive where we had a suspension test of Tata Bolt near Sector 29 Gurgaon.There was a proper race track with twist and turns and my team member drove the car over the a small area of rough patch with speed breakers where we had the activity to connect the dots. The test was a success as I was able to connect the dots without any difficulty. Next we headed to the national highway to our journey where I tried to experiment with different features.The first thing was checking the Harman infotainment system and GPS guidance. The digital screen is very user friendly and can be operated without guidance.One of the features which I like about this car is the Smartphone integration with the voice command feature that can automatically read out the messages from the phone. This feature is really needed as I have seen many people look down to read the message for few seconds while driving and thus lose their attention which could lead to accident or loss of control. 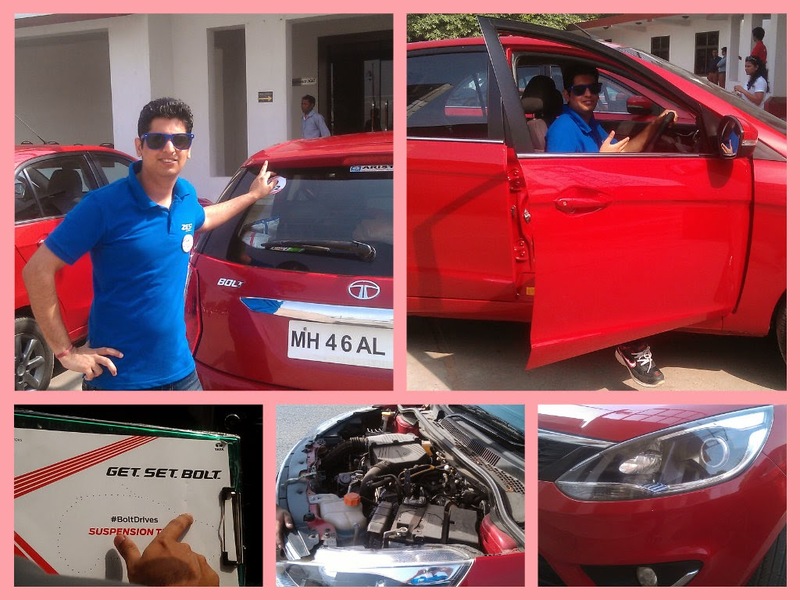 We got the opportunity to test drive both petrol and diesel variant. During the midway pit stop I took the time to check the exteriors and exclusive smoked projector headlamps. Another thing about Bolt is that the car is full of thrust with Revotron 1.2 T turbocharged engine which redefines the way we drive and Eco,City or Sports mode gives you better performance and maneuverability while driving.After the second stop,we decided to keep the car on sports mode as it was national highway and we were lagging behind other team.The sports mode really worked for us as we were able to accelerate and catch up with them.Driving is fun and made easy with Tata bolt.Though we wanted to drive at fast pace as there was very less traffic on highway but captain bolt was monitoring us and we had to put our break at speed limit of 90 km/hr.Further,the automatic EPAS system Electronic Power Assisted System made drive more pleasant and comfortable. We reached the 14th century magnificent Neemrana fort palace which still has the old charm and royal look. The hotel staff welcomed us with refreshing nimbu pani and then I took my mobile phone to click some pictures of the unique architecture and antique items. Then we were guided to the Jalgiri restaurant where the hotel staff told about the history of this palace and followed by guided tour of this palace. Then we had some session with mouth watering snacks and the big surprise of the day. I feel that dreams do come true and anything can happen in this world. No one can better justify this statement other than one of the blogger Ragini Puri who won the Tata Bolt car as the prize of the blogging contest. It is incredible that bloggers are now getting the recognition by the brands and there are making an impact on digital branding. 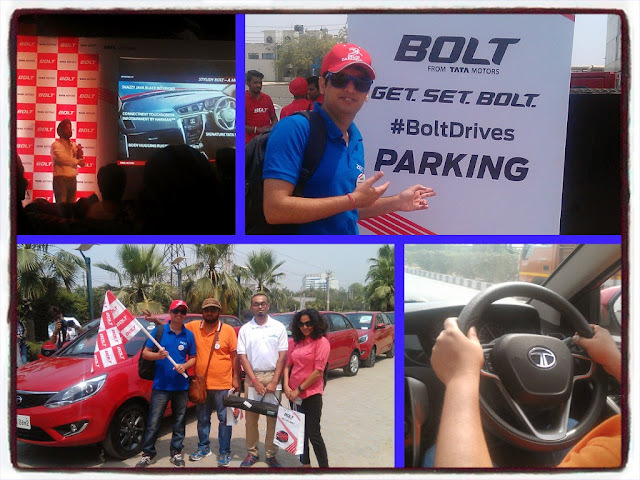 Overall I enjoyed every moment of this adventure and historical #boltdrives and a big thank you to Blogadda team and Tata motors for making it possible. Hey.. Nice blog! Relived the moments :) Drop me an email at hello@mohulghosh.com for more pics! thanks Mohul ! It was a pleasure to be your team member.